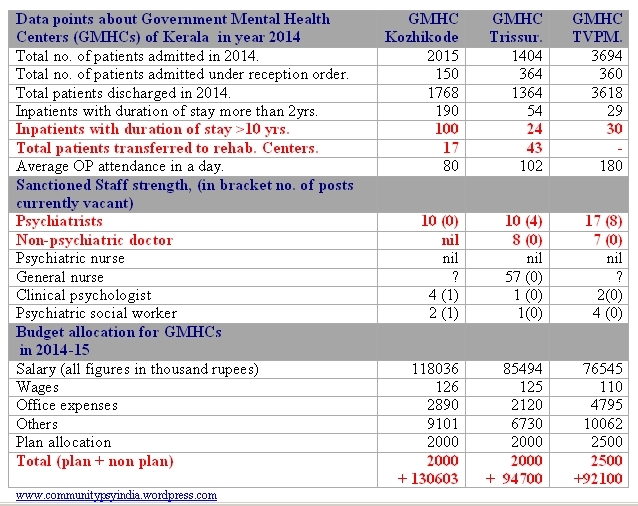 Home » Mental Health Policy » A brief focus on certain system-level variables from Mental-Hospitals of Kerala. A brief focus on certain system-level variables from Mental-Hospitals of Kerala. Information at the level of health systems will be important for better policy making and charting out reform agenda for change. The reform agenda for mental hospitals of Kerala has not, as yet taken off, though it has long been repeatedly articulated since 1979 (Pai committee report). The latest of such reports being the 6th estimate committee report (PDF) (2012) by the legislature under V D Satheesan MLA. A lack of a mental health information system which can capture data on health system variables may have contributed to the reform gap. I have collated here, data on a few variables which I felt was important. These data were requested from the three government mental hospitals (GMHCs –Government Mental Health Centres) through RTI (Right To Information Act, 1987) query to the public information officers of these institutions. The data on financing of the institutions was collected from the annual plan document 2013-14, Government Of Kerala, which is available in the public domain. Data points (see Table 1) are clustered under three domains and certain data points are elaborated and commented upon in the discussion. A total of 154 patients as on 2014 are admitted and staying the Mental Hospitals for more than 10 years out of which 100 are in GMHC, Kozhikode. In absence of a plan for this subset of patients it is possible that these patients will remain in the centers for the rest of their lives. It was reported that a total of 60 patients were discharged and transferred to private rehabilitation homes. A possible alternative could be to contact the Dept. of housing  of Gov. of Kerala and explore means for building permanent housing for them. Any of the GMHCs could pilot a model of supported housing for these patients. (2) Staff pattern sanctioned and currently present: Till date, shortage of staff in GMHCs had been a persistent problem. Thanks to proactive measures by the government via post creation (See here ) shortage is being steadily rectified. 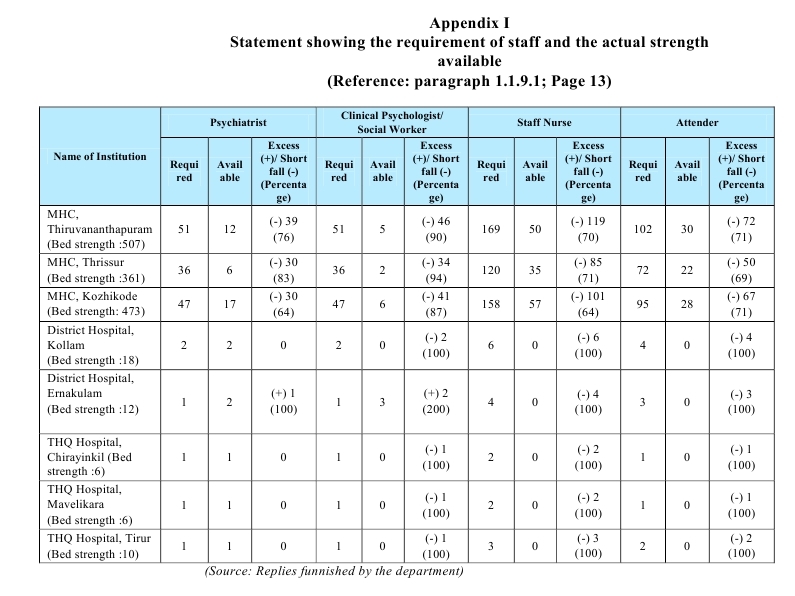 Currently sanctioned posts for doctors are steadily getting filled though the requirement as put by the centers are very high (Click to see a table from appendix of CAG performance aduit report). We can see that currently, there is no shortage for doctors in sanctioned posts but shortage of other professionals does exist. (3) Financing available to the institutions in the year 2014-15 is 323903 thousand rupees (32.39 crores) of which 28 crores( 86.44%) goes towards salary of personnel. During the corresponding period money allotted to community mental health services of all 14 districts was 4.79 crores. 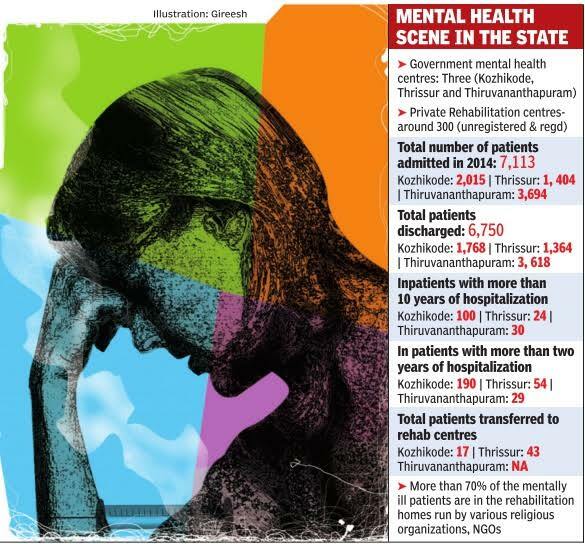 Much of the annual state budgetary allocation for mental health under the health budget currently goes to the three mental hospitals of Kerala. Tail piece: Regarding the reply to the question on “how many patients are currently admitted and staying more than two years” : as the question was little ambiguous the figures may not be reliable, nevertheless the total number is 273. These patients were engaged in various activities in the centers as per table 2. I am afraid many of these interventions may not pass the test of a rigorous state of the art evidence-based-rehabilitation techniques of modern times. (Added on Aug,10, 2015) The data from this post got represented in an infographic (see below) which came in Times of India article. By kumarRam in Mental Health Policy, Services & Policy on April 16, 2015 .